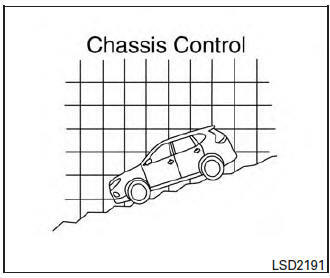 Never rely solely on the hill descent control system to control vehicle speed when driving on steep downhill grades. Always drive carefully and attentively when using the hill descent control system and decelerate the vehicle speed by depressing the brake pedal if necessary. Be especially careful when driving on frozen, muddy or extremely steep downhill roads. Failure to control vehicle speed may result in a loss of control of the vehicle and possible serious injury or death. The hill descent control may not control the vehicle speed on a hill under all load or road conditions. Always be prepared to depress the brake pedal to control vehicle speed. Failure to do so may result in a collision or serious personal injury. The hill descent control system can only be activated when the AWD LOCK switch is engaged. The hill descent control system helps maintain vehicle speed when driving under 15 MPH (25 km/h) on steeper downhill grades. Hill descent control is useful when engine braking alone cannot control vehicle speed. Hill descent control applies the vehicle brakes to control vehicle speed allowing the driver to concentrate on steering while reducing the burden of brake and accelerator operation. If the hill descent control light is blinking, the hill descent control is engaged; however, the hill descent control will not control the vehicle speed. When additional braking is required on steep downhill roads, activate the hill descent control system by pushing the switch ON. For additional information, refer to “Hill descent control switch” in the “Instruments and controls” section of this manual. Once the system is activated, the indicator light will remain on in the instrument panel. For additional information, refer to “Hill descent control system on indicator light” in the “Instruments and controls” section of this manual. If the accelerator or brake pedal is depressed while the hill descent control system is on, the system will stop operating temporarily. As soon as the accelerator or brake pedal is released, the hill descent control system begins to function again if the hill descent control operating conditions are fulfilled. For the best results, when descending steep downhill grades, the hill descent control switch should be ON and the shift lever in L (Low gear) for engine braking.